GENEVA, Switzerland -- The United States, Russia, Ukraine and the European Union reached an agreement here on Thursday evening that calls for armed pro-Russian bands to give up the government buildings they have seized in eastern Ukraine and outlines other steps to de-escalate the crisis. Secretary of State John Kerry described the package of measures as an important first step to avert “a complete and total implosion” in eastern Ukraine and said that it could be followed by negotiation of more far-reaching steps to ease a crisis in which violence seemed to be growing by the day. Mr. Lavrov said the deal was “largely based on compromise” and that a settlement of the crisis was primarily the responsibility of Ukraine. 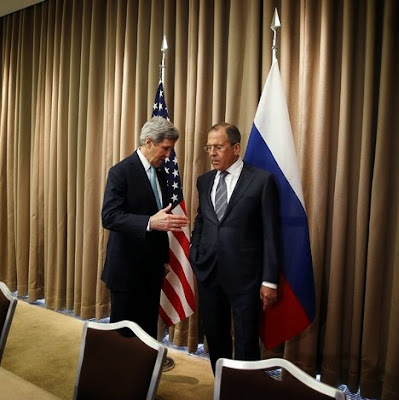 Mr. Lavrov made the remarks at a news conference that he gave before Mr. Kerry had spoken. But President Obama sounded a cautious if not skeptical note in Washington. Judging by the early reaction on the street in eastern Ukraine, in the absence of a strong push by Moscow, such skepticism is well justified. Vasili Domashev, who described himself as an aide to the commandant of a building under occupation in Donetsk, said that since no representative of the newly declared and wholly unrecognized People’s Republic of Donetsk had been invited to the Geneva talks, the republic would not be bound by the decisions made there. Though Western governments maintain that Russia holds sway over the groups here, Mr. Domashev said that was not the case. “We will not leave,” he concluded. The agreement, described in a joint statement, does not specifically require Russia to remove the approximately 40,000 troops it has on Ukraine’s border, as Mr. Obama has demanded. Nor does it commit Russia to holding direct talks with the interim Ukrainian government, which has been another American demand. The agreement also does not mention the Russian annexation of Ukraine’s Crimea Peninsula last month. The agreement on “initial concrete steps to de-escalate tensions and restore security” in Ukraine followed more than six hours of talks here that involved Mr. Kerry, his Russian counterpart, Sergey V. Lavrov, Ukraine’s acting foreign minister, Andrii Deshchytsia, and Catherine Ashton, the foreign policy chief for the European Union. It calls on all sides in Ukraine to refrain from violence or provocative behavior and rejects all forms of intolerance, including anti-Semitism, which Mr. Kerry said had emerged as a worry in eastern Ukraine. “All illegal armed groups must be disarmed,” the statement declares. In recent days, the United States and other Western nations have repeatedly charged that Russian agents had orchestrated the seizure of government buildings in eastern Ukraine. President Vladimir V. Putin of Russia denied the allegations in a question-and-answer session on Thursday on Russian television. But he also said Russia reserved the right to intervene militarily and he used new language that asserted Russia’s historical claims to parts of eastern Ukraine. Under the agreement negotiated in Geneva, the Ukrainian government would grant amnesty to protesters who leave the government buildings they have occupied and agree to give up their arms, unless they are suspected of murder or other capital crimes. International monitors from the Organization of Security and Cooperation in Europe, a 57-nation group that includes Russia, are to play a “leading role” in helping Ukrainians carry out the de-escalation measures. And the statement endorses the importance of economic support to Ukraine. Mr. Kerry said at a news conference that it was critical that the measures be “translated immediately into actions” and that he hoped more far-reaching steps could follow. “None of us leave here with the sense that the job is done,” he added. The measures requiring armed groups to vacate government buildings in eastern Ukraine was singled out by Western officials as an especially significant measure, and Mr. Kerry made it clear that the Obama administration would hold Russia accountable to see that it was carried out. “If there is not progress over the course of these next days and we don’t see a movement in the right direction, then there will be additional sanctions, additional costs as a consequence,” Mr. Kerry said. In response to a question, Mr. Kerry insisted that the United States had not dropped objections to Russia’s annexation of Crimea, but acknowledged that it had not been the focus of the meeting. “We didn’t come here to talk about Crimea,” he said. While there has been no Russian commitment to withdraw forces from Ukraine’s border on a specific schedule, Mr. Kerry said the Russian side had suggested that the presence would be reduced as the crisis eased. The talks were held at the same luxury hotel where five years ago Hillary Rodham Clinton, who was then serving as the secretary of state, presented Mr. Lavrov with a red “reset” button intended to signal a fresh start in the White House’s relations with the Kremlin. The purpose of the Thursday session was to bring Ukraine and Russia to the same table, with the United States and the European Union participating, and foster a dialogue on political and security issues. As the talks began, all sides had an incentive to avoid a diplomatic confrontation. Russia wanted to avoid the perception that it was being uncooperative in the search for a diplomatic solution and, thus, discourage Western nations from imposing new economic sanctions. American officials have also sought to give Ukraine time to hold its May 25 presidential election without more extensive Russian interference. European nations, for their part, would prefer not to impose wide-ranging economic sanctions, which could hurt trade with Moscow. The deeper question was whether the statement issued on Thursday would open the door to a diplomatic resolution of the Ukraine crisis or remain a limited step that bypasses core issues like the degree of federalism in Ukraine, the presence of an intimidating Russian force near Ukraine’s border and Russia’s reluctance to recognize the legitimacy of Ukraine’s new government.